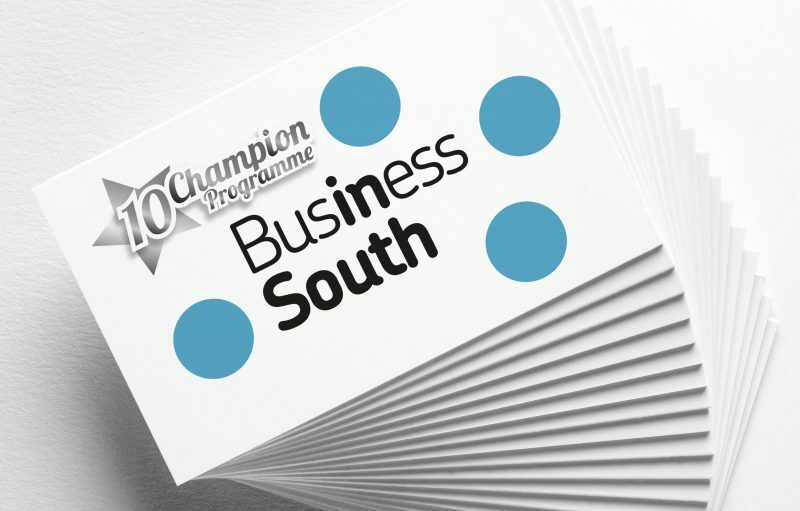 #InTheStudioThisWeek, we’re enjoying seeing Business South’s ‘10 years a Champion’ logo in use. We were asked to create a new element to add to their existing logo to celebrate 10 years of their Champion Programme. We saw it in use at last week’s annual conference. we are proud to be a Business South Champion! Business South is an independent and influential organisation, connecting leading employers to promote the place & Champion the economy in our region. They aim to put businesses in the driving seat, to tell a compelling story of our region and illustrate they have so much to offer in terms of investment potential, innovation and growth. Their VISION is for the Business South region to be recognised nationally and internationally, as a preferred location of choice, able to attract and retain talent, driving increased opportunities for investment and business. Business South work strategically across the South Central region to unite business to influence positive change, while retaing a focus locally on key sectors and projects. They aim to put businesses in the driving seat and to tell the story of a region that is the best place to do business that offers so much in terms of investment potential, innovation and growth – in short it is a great place to do business, to live and to learn, rest and relax. Business South want to showcase the employers who are investing in their community and shout about the responsible business leaders who, for example, demonstrate a corporate conscience by engaging in the talent and skills agendas. By doing so, they support the work of Business South in Championing the economy – and boost the number of jobs and opportunities.